Brick pastry samosas filled with goat's cheese and black olive tapenade served on a bed of cherry tomato and pesto salad. Wash all of the vegetables. Quarter the cherry tomatoes. Peel the garlic, cut in half and remove the green sprout. Finely slice the spring onions. Pick the basil leaves. To make the pesto: place the basil, garlic, pine nuts, parmesan, olive oil, salt and pepper in a food processor or a pestle mortar. Blitz to make a rough paste. Check the seasoning. Spread the flaked almonds on to a baking sheet and toast in the oven until golden brown. Set aside. Place the tomatoes, spring onion and the pesto in a bowl and mix together. Allow to marinade while you make the samosas. Cut the brick pastry into 3 strips approximately 5cm wide. Mix together the goat's cheese and the tapenade. Season with freshly ground black pepper. Place a spoonful of the goat's cheese mixture at the end of each strip of pastry. Fold the pastry in triangles to make a samosa. Secure the parcel with a little olive oil. Heat a frying pan to hot and add a little olive oil. Place the pastries in the pan and cook until golden brown on both sides. 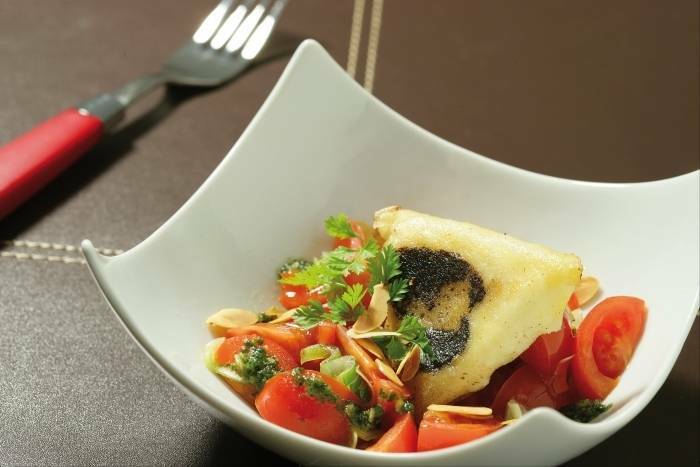 Serve the goat's cheese pastries on a bed of tomato salad and sprinkle with toasted almonds.